Liquid encapsulation is a process which includes coating of materials such as polymer, metal and ceramics on devices in the form of solid or liquid to protect the devices form shock and moisture. To ensure proper functioning of devices and to overcome misconnection of electrical components on devices, liquid encapsulant materials are applied on them. These encapsulant materials contain epoxy resin and epoxy modified resin materials. The liquid encapsulation market, in terms of value, is expected to grow rapidly during the forecasted period at a CAGR of around 7.1%. Liquid encapsulation plays a vital role in functions of a device as it helps to prevent the malfunctioning of the components in the electronic devices. Due to this reason liquid encapsulation is widely used in semiconductor and electronics industry where small components are needed to be placed precisely over the device. Due to this application of liquid encapsulation the demand for liquid encapsulation is expected to rise in numerous industries over the forecasted period. Increasing technological advancements in the electronics industry anticipated to foster the growth of liquid encapsulation market globally. Growing demand for number of miniaturized electronics also drives the growth of liquid encapsulation market. 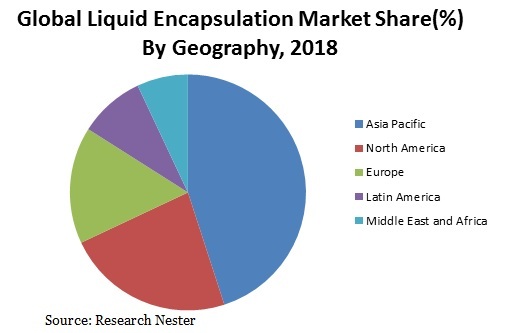 Expansion of consumer electronics market and growing improvements in sensors and integrated circuits market are expected to stimulate the growth of liquid encapsulation market. Increasing number of sealant manufacturers and dispense equipment industries fueling the growth of liquid encapsulation market globally. Rapid industrialization in developing economies such as China and India are also contributing in the growth of liquid encapsulation market. Growing demand for sensor based applications in various semiconductor industries across the globe is likely to drive the market of liquid encapsulation in near future. Optoelectronic devices such as LEDs are witnessing great demand across all regions. Further, use of liquid encapsulations in optoelectronics devices is a major factor that is expected to spur the growth of liquid encapsulation market globally.